#1 Q. Why are two forms of vitamin C included in FORMULA-216™ if the product is supposed to turn the GULO gene back on so vitamin C can be naturally produced internally? The olive extract in FORMULA-216™ double existing vitamin C levels. So the effect maybe amplified by raising blood levels of vitamin C concomitantly by vitamin C supplementation and gene activation. #2 Q. What are the other ingredients in FORMULA-216™ and why are they included in the formula? Most people take vitamin C to improve their immune system and ward off any infectious diseases. When noted vitamin C researcher Linus Pauling was conducting human trials with oral and intravenous vitamin C he noted that white blood cells still remained sluggish. A reason for this is the lack of zinc. Zinc is required for the thymus gland to product memory T-cells that afford life-ling immunity from infectious diseases. Zinc is in short supply even in advanced countries to due to high calorie malnutrition. Furthermore, vitamin D is included in FORMULA-216™ to normalize the immune response. Also FORMULA-216™ included resveratrol that sensitizes the vitamin D cell surface receptor. This makes vitamin D work better. Additionally, FORMULA-216™ included beta cyclodextrin to improve absorption of all ingredients and serve as a stabilizing molecule. #3 Q. 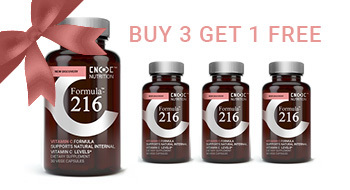 What is the best way to take FORMULA-216™? With food. This avoids nausea that sometimes occurs when taking vitamin pills on an empty stomach. #4 Q. Why are bioflavonoids included in FORMULA-216™? Because bioflavonoids slow the absorption of vitamin C and prolongs its effects as well as strength blood capillaries (connectors between arteries and veins). #5 Q. Should everybody take FORMULA-216™ or just those who are vitamin C deficient? The gene mutation that has disengaged the human body’s ability to internally make vitamin C has never been fully compensated for by vitamin C supplementation. Therefore, everyone should take FORMULA-216™. #6 Q. Why can’t I just eat a couple of oranges to boost my vitamin C levels? An orange provides ~60 milligrams of vitamin C, as do kiwi, papaya, guava and black currant seed. It would take 5 oranges a day to significantly and transiently raise blood levels of ascorbic acid (vitamin C). #7 Q. What depletes the body of vitamin C? Stress; certain drugs (steroids, acetaminophen, aspirin); tobacco use; diuretic water pills are the most common. #8 Q. What are common signs of vitamin C deficiency? Swollen bleeding gums, lassitude, painful joints, easy skin bruising, black & blue marks on the back of the hand (ecchymoses), anemia, rough skin, corkscrew body hair, spoon-shaped fingernails, weight gain, pinpoint red dots on skin (petechiae), shortness of breath (anemia), loss of blood sugar control. #9 Q. Can the FORMULA-216™ capsule be opened and put in juice or water? Yes, for those who have difficulty swallowing pills. Best to add to juice to mask any bitter flavors. For those who do have difficulty swallowing pills, placing the capsule in the mouth after chewing food and then swallowing with a bolus of food is a good way to deal with this challenge. #10 Q. Can I take extra vitamin C in addition to FORMULA-216™? #11 Q. Can I take Formula-216 if I have a Glucose-6-phosphate dehydrogenase enzyme deficiency? If you have a known G6PD deficiency, you should check with your physician before taking this supplement. G6PDD deficiency combined with very high doses of vitamin C can cause adverse symptoms. #12 Q. How well are olive leaf molecules absorbed and how much is bioavailable? Phenols (fee-nols) are metabolites of plants that are produced to provide antioxidant defense and have anti-fungal, antibacterial and anti-viral properties. The word polyphenol means the molecule has many phenol units. Polyphenols are small molecules that can pass through cells walls and enter the genetic machinery located in the nucleus of living cells. Olive leaf polyphenols are well absorbed – at least 55-66% absorbed in the intestines. A more definitive test shows 71% of olive leaf polyphenols are orally absorbed. The absorption of polyphenols from olives varies considerably from person to person. Olive-derived polyphenols are provided in small amounts in olive oil. Consumption of olive oil (50 grams) only provides ~ 2 milligrams of polyphenols to produce a blood plasma concentration of ~13 micromole, much lower than the minimum 50 micromole concentration demonstrated to produce meaningful antioxidant activity in a lab dish. Hence, concentrated polyphenols extracted from olive leaves as provided in a dietary supplement are necessary to achieve optimal antioxidant protection. Once olive derived molecules are consumed and absorbed, they are shuttled to the liver where they are attached to detoxification molecules (sulfate/glucuronate). About 44% remains unbound and is immediately bioavailable. #13 Q. WHY DOES FORMULA-216 provide supplemental vitamin C? FORMULA-216 provides two forms of vitamin C, water and fat soluble. Those forms of supplemental vitamin C are normally depleted within a couple hours following ingestion. Formula-216 is doubling vitamin C levels and maintaining elevated vitamin C levels for many hours, up to 24 hours in a day. Vitamin C is included in FORMULA-216 because the precise underlying mechanisms in FORMULA-216 are not fully know at this time. Two known mechanisms, recycling of existing vitamin C in the kidneys or editing the gene involved in making a protein that converts blood sugar to ascorbate (vitamin C), are proposed, the latter being the most likely mechanism. It could be the ingredients in FORMULA-216 double baseline levels of vitamin C and therefore it may be important to have a minimum vitamin C level prior to consumption of FORMULA-216.